East Anglian winery Flint Vineyard has revealed the first results of its study on the aromatics of the German white wine grape Bacchus, which suggest it is has less in common with Sauvignon Blanc than is often thought. Winemaker Ben Witchell presented findings from Flint’s research into the aroma of Bacchus wine at a Bacchus Mini Symposium held by the East Anglian Vineyards Association on 24 November. 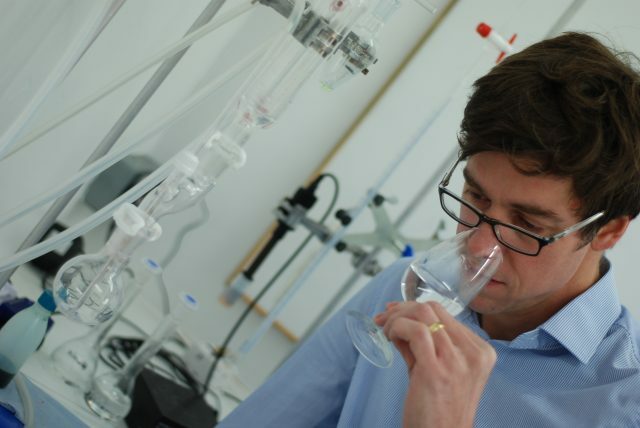 Working in collaboration with Campden BRI, one of the leading analytical wine laboratories in Europe, Witchell has been attempting to unpick what makes up the distinctive aroma of the German grape crossing. The first part of his research aimed to define the profile of a typical Bacchus wine. This was done by analysing 19 different English Bacchus wines from 2015 using Gas Chromatography/Mass Spectroscopy (GC/MS). Six non-Bacchus wines were also analysed and compared with the Bacchus wines to provide an understanding of where the aromas might originate. The comparative wines included Riesling, Müller-Thurgau and Sylvaner, which were chosen due to being the parent varieties of Bacchus. Sauvignon Blanc, Muscat and Verdejo wines were also made part of the study because of their similar aromatic profiles. One of the most surprising results of the research was that the thiol compounds which are so important to the aromatic profile of Sauvignon Blanc were not all found in Bacchus. Only one of them, known as 3 MH, which is responsible primarily for grapefruit and passionfruit aromas, was observed, and only in trace amounts. Witchell said that this suggested Bacchus may not be quite as similar to Sauvignon blanc as previously thought. One of the most abundant aromas picked out by the analysis was hotrienol, a strongly aromatic terpene. This is commonly found in German varieties such as Riesling and Gewürztraminer and can have a sweet, basil-like, lime or grapefruit peel aroma, Witchell explained. These are all common descriptors for Bacchus. The work also uncovered a large number of aromatic esters, which seem to underpin the aroma of Bacchus, implying that it is an unusually complex variety, Witchell said. This supports the winemaker’s belief that Bacchus has the potential to produce complex, aromatically compelling wines fit for the world stage. “These results may change the way we think about Bacchus and the approach we take to winemaking, in particular yeast selection, enzymes and skin contact,” Witchell commented. The winemaker’s research will go on to focus on how different winemaking techniques influence the production of these important aromas. This is likely to focus on aspects such as juice oxidation, skin contact, use of enzymes and the influence of ageing. The Bacchus Mini Symposium, held at Copdock Hall Vineyard in Suffolk, focused entirely on the Bacchus grape. Speakers included Ben Witchell (Flint Vineyard), Geoff Taylor (Campden BRI), Tony Milanowski (lecturer in oenology at Plumpton College), Duncan McNeil (Vineyard Management Consultant) and Mike Paul (Wine Marketing Consultant).